The manufacturing and supplying company brings forth a variety of NGR (neutral grounding resistors). One of them is punched stainless steel grid type NGR, developed as per the ISO 9001:2008 standards. 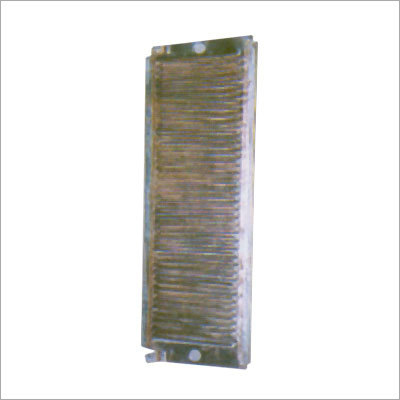 Non-breakable steel alloy grids are used to give the system desired durability and lastingness. Terminals designed for two conductors in the resistor make them resistant to vibrations. We have ISO accredited manufacturing unit, where this system is developed. The quality control is implemented throughout the production process to ensure the optimum functionality and performance of system. The punched stainless steel grid type NGR is inspected and tested to ensure its compliance to the spec sheet. The tests performed include visual check, dimensional check, resistance value check, high voltage withstand test and insulation resistance measurement. Buy this system today to safeguard your valuable equipment in your factory from damage caused by fault current. Copyright © 2019-20 by NATIONAL RESISTORS All Rights Reserved.